The Mister and I went to visit the school that The Little Mister will go to in September. It was all a bit surreal to be honest. 1. School drop offs and collections are going to be tricky. 2. I am not sure how we are meant to fit our working hours around these drop-offs/pick-ups. 3. It would be much easier if I didn’t work. As we left we spotted this sign on the wall. We expect The Little Mister might be making good friends with it! I had one of those days at work. I don’t get massively stressed these days but today there were a few things bothering me and as a result I snapped unnecessarily at one of my colleagues and then had a childish stop. I was ridiculous. I got back to my desk after seeing a client to find this thoughtful and kind desk perched on top of my keyboard. Thank goodness for friends and colleagues who know me well. 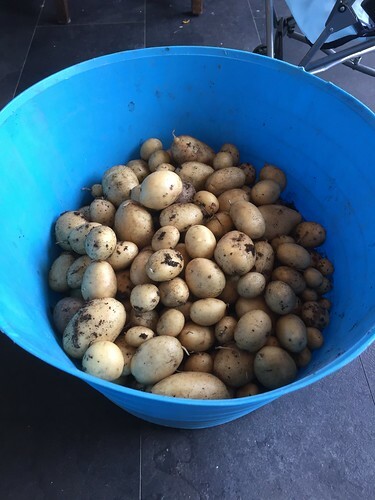 Not a bad haul of potatoes. The garden is feeding us well at the moment. 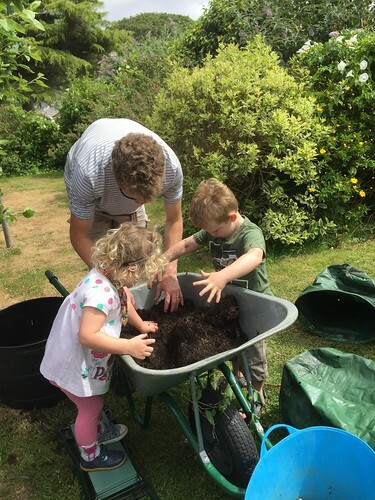 We had a busy afternoon in the garden and The Mister and the kids emptied out all the bags of potatoes. We did pretty well and managed to get a trug about 2/3 full. The children really enjoy digging through the soil to see what treasures they can find! 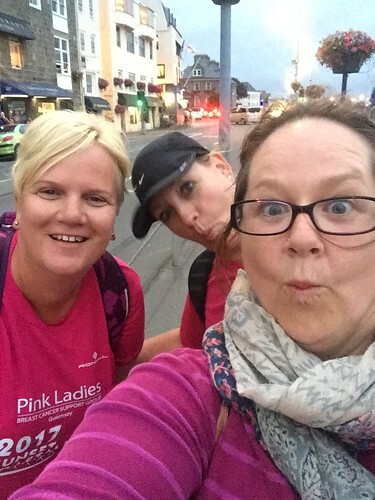 This evening I agreed to take part in a charity walk for the Pink Ladies. 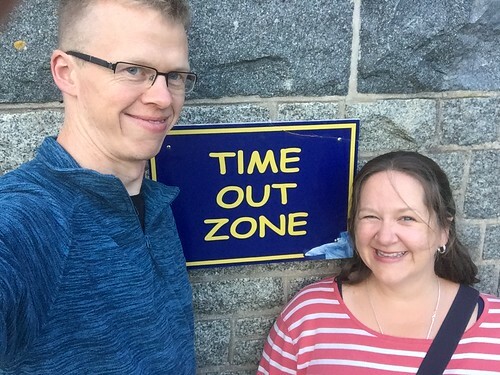 It was a sunset walk starting at 6pm and walking around the coast, ending up in town where there was an Abba tribute band playing. It was a good walk – 10.5 miles – and by the time I got to town my hips were killing me. I managed the last couple of miles with a can of gin and tonic in my hand. A fab evening with our lovely childminder Jane and some of her friends for company. Thanks everyone. Fridays are busy for us and The Little Miss has a swimming lesson. 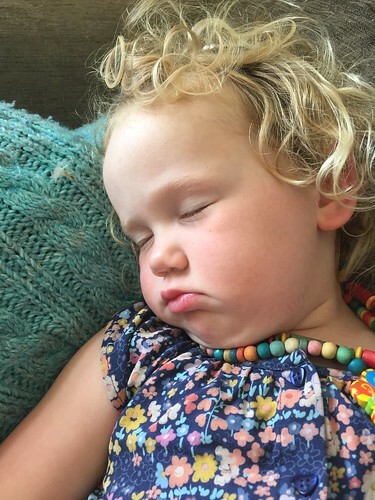 Unfortunately it has worn her out and she was a nightmare to wake up… that also meant bedtime was rather trying! 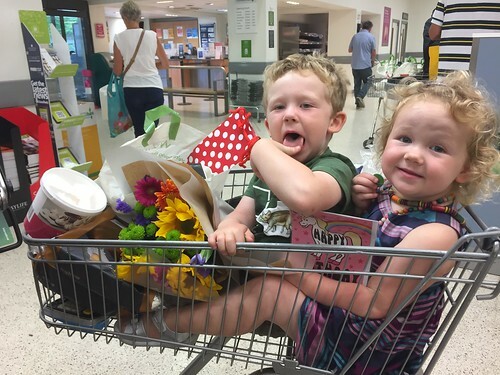 It’s amazing what you can buy in Waitrose these days! If these two are feeling helpful they will ‘assist’ me by scanning the items and putting them in the bag for me. If they aren’t feeling helpful they will scan things multiple times and add stuff to the trolley that I don’t need! Roll on another day – 29 degrees and gorgeous sunshine! The Mister came home a little early and we headed straight for the beach for a swim at high tide with some friends. One of the best things about living in Guernsey is the ability to leave work and be at the beach within 15 minutes. 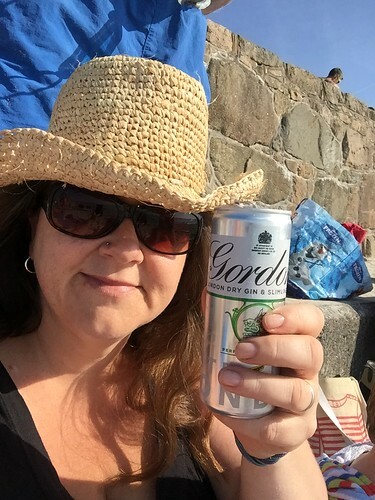 You don’t get much better than gin and tonic in a can on the beach! Another extremely hot day and the kids spent much time in the paddling pool at the childminder’s house. As a result all of their clothes were wet so they piled in the car semi-naked and went straight home for bath and tea. 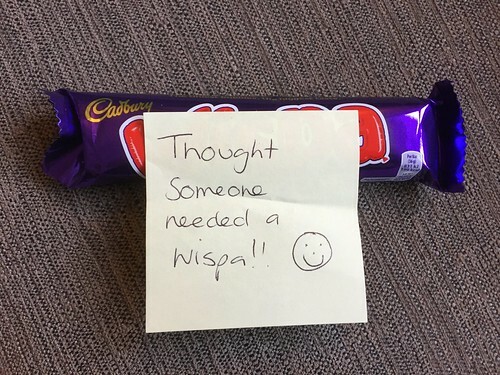 It has been absolutely roasting today and I had several texts from my childminder of the beach… just what I want to see whilst I am in a hot office! This was the one that made me laugh the most. 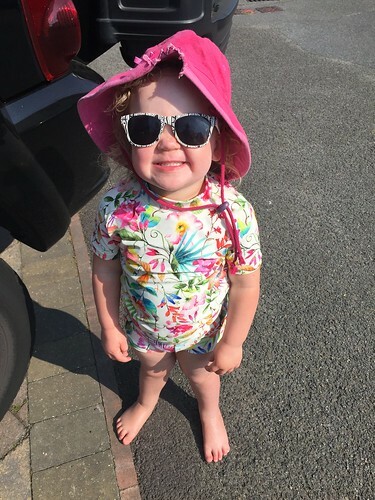 The Little Miss who is ‘beach ready’!